H2O has a large T-shaped cockpit with all control lines leading aft. Over a bridge deck through double doors is the spacious pilothouse with helm forward to starboard and a settee and dinette to port. There is access under the settee to a functional workshop. From the pilothouse aft to starboard is a roomy aft double cabin with plenty of standing headroom. Forward to port is an over/under cabin. Just forward of that cabin to port is the dual access head with stall shower and further forward is the centerline double master stateroom. 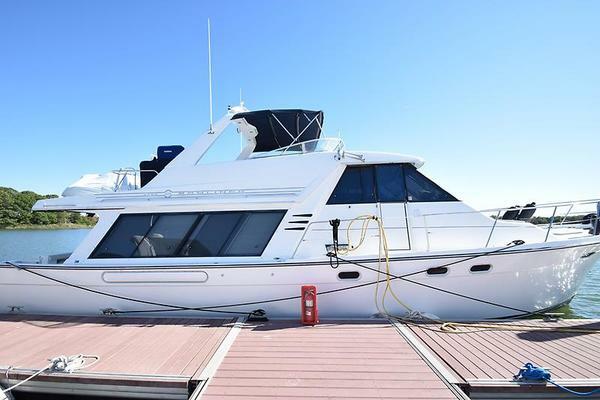 The spacious pilothouse is three steps down from the cockpit and is beautifully appointed in Costa Rican teak with 360 degree visibility from the helm and all seating positions. To starboard is the fully equipped helm station with S.S. Edson distroyer wheel, full array of electronics and a large chart table just behind. The dinette is to port with a custom teak table and a U-shaped designer fabric settee that can convert to a single berth. The settee is designed to fold up and allow access to a cleverly located workshop with storage for tools, and workbench with vise. The full service galley is opposite the mid cabin to starboard and two steps down from the pilothouse. It is appointed with beautiful Costa Rican honey colored teak joinery work, louvered cabinetry, and Corian countertops. Storage is exceptional, with a double cabinet for dishes, two large pantries with double sliding doors, an additional pantry to port, under sink cabinet, and storage bins under the steps. In addition there are also ten drawers. The master stateroom is forward with beautiful teak joinery work with louvered teak doors on all cabinets. 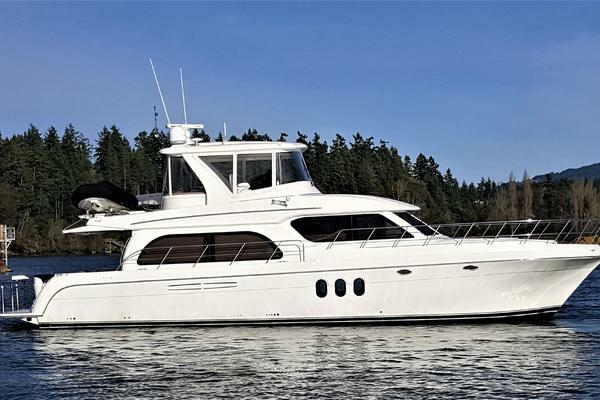 It features a queen centerline berth with gas-prop assisted lift feature to access storage, tankage, bow thruster, safe deposit box, and numerous seacocks. There is private access to the head on the port side. The head is dual access and functions as the ensuite head for the master, but with addition access for the other cabins and as a day head. It is spacious with a separate stall shower. The mid-cabin is to port aft of the head and feature single over/under berths with Tempurpedic mattresses. There is a built-in night stand forward with threee drawers and a book case above. Aft is a hanging locker and storage bin. The aft cabin is to starboard and a step down from the pilothouse. It features a double berth with Tempurpedic mattress and a small vanity with mirror. This vessel is equipped with an aluminum double spreader mast with oversized wire rope rigging. It features a clipper bow with furling headsail, hank on staysail, running backstays, and a boom furling main. All control lines lead aft to the cockpit. The mast also features (3) deck lights, masthead light, radar dome, VHF wip antenna, lightning arrester, wind sensor, and windex. Side decks provide easy access to the foredeck with plenty of working space. athe high bulwarks and hand rails offer safe movement under any conditions. H2O have a large user-friendly T-shaped cockpit with port and starboard seating and a build in helm seat. There is a large sail locker to port that afords access to the genset. The aft deck has port and starboard propane lockers and a large lazarette.